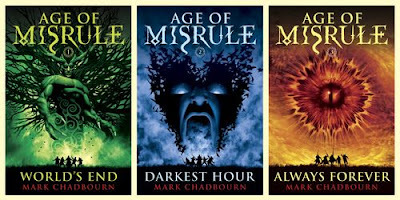 Well the results are in from my most recent poll and it looks like I'll be reading Mark Chadbourn's Age of Misrule series before the year is out, which won with 30% of the votes narrowly beating out Stross's omnibus edition of the first two Bob Laundry books. I was a bit surprised this series won given so many of my compatriots have reviewed it over the past few months, but I'm looking forward to the challenge. I may break the read up with something a little different between each volume though, but I'll probably start on the first volume World's End by next week. I also have some air travel around Thanksgiving that will help me get through the series quickly.